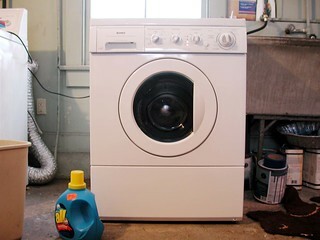 We bought a Kenmore Tumble Action Washer (which the Sears website calls a Kenmore White-on-white 3.1 cu. ft. Front Load Electric Washer w/Eco Care™ System!) last Tuesday. It was delivered Thursday, but I didn’t see it in action until yesterday. Wow. I’m not one to wax on about appliances, but this thing is awesome. It uses a lot less water than a top-loading model. It saves energy. It’s quieter. It’s fun to watch. It’s gentler on clothes. And it spins clothes much drier, so they don’t have to spend much time in the dryer. This is a bottom-of-the-line front-loader; it only cost $600 some dollars. That’s three times what a cheap top-loader costs, but it might just pay for itself if it holds up for a good long time. Some of the reviews at Epinions make me wonder if we should have bought the extended warranty. July 27th: Mailed in my rebate coupon. September 4th: Got my rebate check. 2005: Washer destroyed by flooding in the aftermath of Hurricane Katrina.